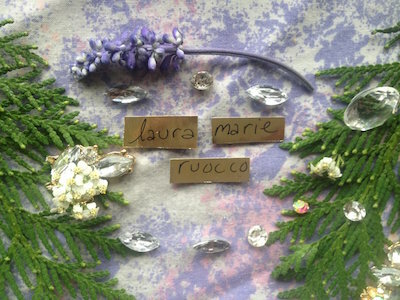 “Working with Laura was deeply healing for my body and my spirit. Having a healer who was non judgmental, kind, and well educated on herbs created an environment where I could really open up and be honest about my body and needs.” -A.G.
“Laura has a magical presence. She is empathetic, generous, thoughtful, and creates a comfortable atmosphere for discussing body and health concerns. Plus, Laura really knows herbs — her recommendations were spot on! I’m grateful to have worked with such a knowledgeable and compassionate healer.” -S.G.
“Working with Laura was like working with a plant librarian—if a plant librarian were actually your best friend. You meet her and she listens patiently to all the stories your body’s been telling you, takes meticulous notes, and then goes back into the earth’s archive to pull out the herbs you need with detailed notes on all of them and how they interrelate. She then follows up with you after, like only a good friend would. Laura’s down to earth, funny, smooth, sensitive, and balanced. All this in a package that doesn’t break the bank or waste your time with ableist nonsense—just real talk and remedy on the ready and routinely willing to actually listen.” -T.Z. “My experience working with Laura Marie really went above and beyond my expectations. I’ve found that I’ve made a lot of healthy choices for myself because of our work together. She’s thoughtful, caring, and wonderful! :)” -D.W.
“Laura consistently made me feel seen and heard and worked with me to find the best herbs to work with my body and symptoms. She is an amazing listener and I felt she truly understood the issues I was experiencing. She provided education about what was actually happening in my body and then used her extensive knowledge of medicinal herbs to offer her suggestions. I really appreciated all the time and care she took each step of the way. The herbs she recommended helped my anxiety and compassion fatigue. I couldn’t recommend Laura more, I really appreciate the grace, knowledge, and compassion she brings to her work.” -W.K.